Finally some big news as the Penguins have brought in Miroslav Satan, Ruslan Fedotenko, and have signed Fleury to an extension. (TSN) Satan will be making $3.5M and Fedotenko $2.5M. Both deals are for 1-year, which fits perfectly into the Penguins' plans by allowing flexibility into the financially tight 09/10 season. Fleury has signed a 7 year $35M deal that will have an annual cap hit of $5M. We'll be updating with more news and opinions later in the day, but heres an idea of the Pens cap situation for anyone interested. We have 8 defensemen signed, not even counting Goligoski. Expect Sydor and possibly another to be shipped out within the next couple days to free up room to sign the rest of the needed forwards. I love how Satan wears two different numbers on each sleeve. I'm surprised Satan didn't sign with the Devils. Someone from another blog astutely pointed out that we now have Satan and God(ard) on our team. 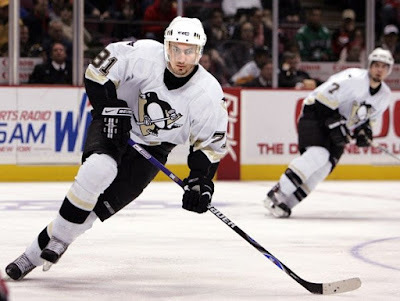 How bout we go back to the good old days of jobbing Scuderi. Him and Gill as a defensive pair = slowest worst stick-handling tandem in the NHL. The fast Red Wings made them look like a-holes. I may even consider moving Whits to the top line as him and Orpik may be playing together for awhile. Scuds was playing with Gonchar on the top-line at points this season. Would you give this guy top line money? No. Just becuase he plays slightly above his $700,000 salary doesn't mean you should love him to death. If someone sold you a $500 car and it ran like $700 car, would you act like it was the greatest thing to happen to you? No. Scuderi was servicable when the team was rebuilding, but we are moving on. Colby, Recchi, Christiansen... these guys were merely steps in the process and now Scuderi had been surpassed too. Its time to let this guy go. He is NOT a face of the franchise. Don't worry about Rob though, he'll be ok. He works hard and from what I hear is a good father and nice guy. He's just not a top 4 defenseman. He will wind up on someone's third line eventually, which is exactly where he belongs. I watched Scuderi throughout the playoffs, believe me I had my doubts about him too, but he held his own. He is a solid defensemen...hes not going to overwhelm you with his offensive prowess, which is exactly why he plays with a guy like Gonchar, who from time to time likes to push the puck into the offensive zone. I like your idea of Whitney with Orpik playing together, because down the road we have invested into making those two our defensemen of the future. Scuderi, if the Penguins can get him at a decent price for next year, should be a piece of this Penguin hockey club. I certainly will not choose him over Sydor. Hopefully Eaton proves to be healthy and we can afford to consider trading Sydor leaving his place for younger, cheaper options. I will certainly give Sydor a chance to prove himself again this year, but I'm not throwing Scuderi under the bus, nor will I leave Hal Gill completely off the pairing all together. Gill was huge against bigger forwards like Jagr.